The wrap reel is used for making leas for strength testing, count testing and for other chemical processing. The leas are either imperial leas having a swift perimeter of one & half yards with 80 turns or metric leas having swift perimeter of one meter with 100 turns. Leas of other swift perimeters and number of turns may also be used for specific applications. The standard wrap reel is suitable for making either imperial or metric leas. Composite wrap reel which can make either of the two types of leas with the help of an additional reel is also available. Reels of other swift perimeters can also be supplied against specific requirements. 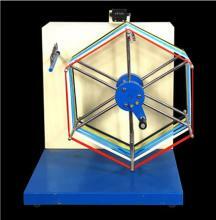 Amith Garments Digital Twist Tester is completely made of Mild Steel which is duly powder coated for long life. It consists of a rotating jaw which is motor driven and next is stationary which is fitted on tensioning assembly. It works on twist-untwist method. Microprocessor based control panel is provided for setting the equipment according to single & double yarn. Digital display of TPI in the control panel is also provided. Tensioning weight from 1 – 50 g is supplied with the machine. Perimeters of Yarns spum on cotton System.